Big data has opened up tremendous opportunities for understanding our urban forests. Big data is a pretty loose term, but for the most part it refers to massive sets of data that owe their existence to the internet. More specifically, the easy ability to collect, store, and share data about everything and everyone doing anything. So how could this possible help our understanding of urban forests? From the simplest perspective, we now have a comparatively quick and cheap way to view our urban forests as tree canopy cover across an entire city using satellite data. Using this information, cities then set future canopy targets in their official plans and policies. 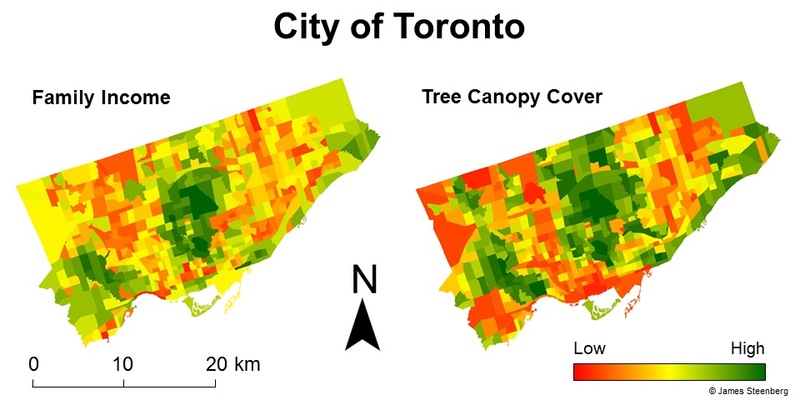 For example, Toronto has adopted the lofty target of increasing its canopy cover from 28% to 40% in the next half century. But what big data has really exposed is that, by and large, the ecology of the urban forest might be as much, or even more, influenced by people as it is by nature. This is because big data allows us to predict things where prediction usually is not possible. Across a single city – again using Toronto as an example – we can see and analyze the distribution of income, education, crime, ethnicity, and trees at the same time. Groundbreaking studies have since shown that trees are associated with higher income, lower crime rates, and better human health. We’ve also seen that city neighbourhoods are de facto ecosystems in the urban forest. Research has even shown who is more likely to plant a tree. The next question is why does all this matter? From a philosophical point of view, it’s nice to know what makes the urban forest tick. But from a management point of view, mixing tree data with people data is incredibly valuable for taking care of the urban forest responsibly. Knowing the current relationship between people and trees in the city (i.e. more money = more trees) can help to illuminate what we want that relationship to eventually look like (i.e. trees for everyone!). In other words, we can begin with questions like who is likely to plant a tree and move to more important questions like who is likely to need a tree. ← Why Do Neighbours Fight Over Trees? Ecology.